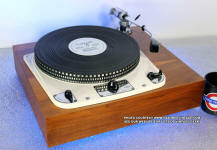 Stereo Turntables, Vintage & Used : Serviced / Refurbished / Restored. Ready to go with a Warranty!!! Vintage Stereo Turntables: Serviced / Refurbished / Restored / Used / vintage stereo turntables & phonographs. Second-hand Record players for 33 1/3, 45, 16, & 78 RPM players by Technics SL, Pioneer PL series, Sony PS / TT, Sansui FR, Technics SL, stereo turntables & phonographs from the 1960's / Sixties, 1970's / Seventies, 1980's / Eighties. 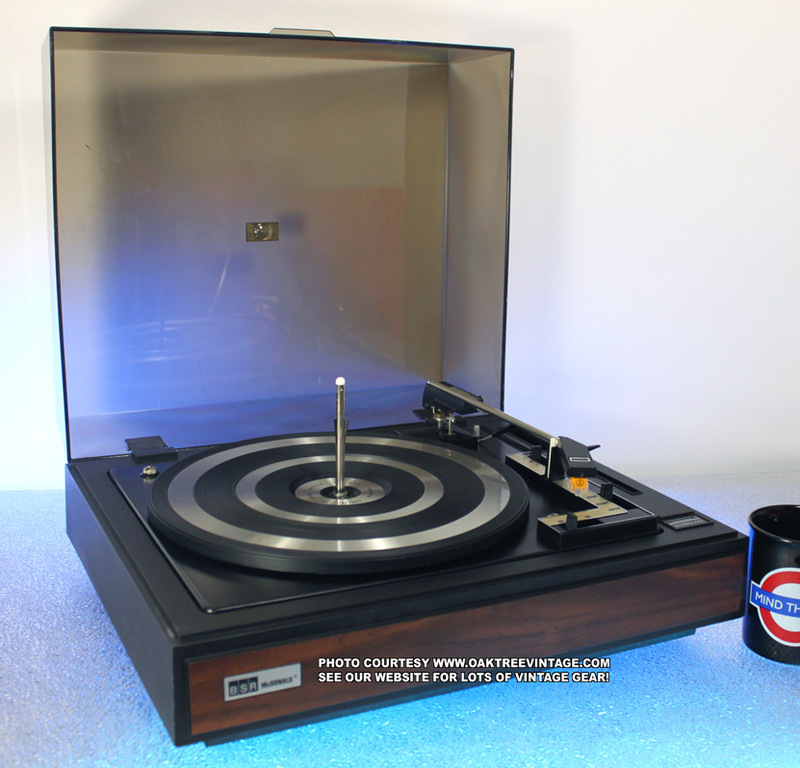 This was a Phase Linear branded version of Pioneer's 'Flag Ship' turntable for this period. We have had 2 of these (the other was the Pioneer version), for over 6 years, waiting for the 'right technician' to challenge them. FINALLY, our current senior technician was up to the task, and restored this one beautifully and CORRECTLY! � Our technician has completely and EXTENSIVELY gone through and 'Certified' this unit which involves disassembly (not an easy task on this table), cleaning inside and out, COMPLETELY DISASSEMBLING, cleaning and re-lubricating internal mechanisms and the balance of efforts listed below. Total technician time to restore 11 hrs (see above collage of bench shots). � Fresh, New and Correct 'Arm Mechanism' belt installed. � End of Play lift and return set with oscilloscope at test point 4 and adj internal VR9. � Tested / analyzed and passed for motor noise and 60Hz hum. � Rubber mat still supple and flexible with no hardening. � Platter speed checked and verified for 100% accuracy with our factory test strobe disc following above restoration. � Platter replaced as the original had a 'few hundredths' of an inch of 'run-out, then tested for 'true flat' and no 'run-out'. Most folks probably wouldn't have noticed, but I did after playing for a while. So back to the shop for another original platter it went. � Original dustcover had a 3-Stage buff, and looks INCREDIBLE, essentially AS NEW. Hinges adjusted to hold it upright as well. You can readily connect this table to any receiver, Integrated amplifier with a standard magnetic phono input, or a Pre-amp. To connect to computer for burning CD's just order one of our inexpensive Phono Pre-Amps and cable kits. � Cartridge / head shell �overhang� adjusted using shop calibration scale. Great performing, sounding and INCREDIBLE looking Pioneer PL-L1000 (read Phase Linear 8000-II), Linear Tracking, Direct-Drive, Fully-Automatic turntable. Following the above restoration, it looks fabulous, now functions correctly and performs well. (1) There is no tracking error thus preventing the generation of harmonic distortion. (2) In principle, there is no generation of inside force and so the crosstalk and inter-modulation distortion are improved and the positioning of the sound image is stabilized. (3) The tone-arm pipe is linear for optimum lateral balance. (4) It is possible to shorten the effective length of the tone-arm and so this feature makes for a low equivalent mass and high rigidity. This combination also reduces resonance in the parts and compound resonance. Sub-functions of the Phase-Linear 8000-II include auto lead-in, auto-return, auto cut, quick repeat, quick play, quick stop, stylus pressure direct readout, arm height adjustment, cueing device and free stop hinges." This table is a 'blast' to use. As the owner of Oak Tree Enterprises, I personally auditioned and did the final testing on this table. I had a few further 'fine tune / tweaks' done by the technician and probably played more than 30 albums on this. - 'Height Adjustable', Rubber Isolation feet for vibration dampening and most importantly with this table, Leveling. Again, our turntable tech has completely and EXTENSIVELY gone through this Phase Linear 8000 as stated above and 'certified' it's ready to go! (total tech time ~11 hours). Following restoration was tested for speed accuracy, rumble, wow & flutter, noise isolation, tone-arm return function and lubed internal mechanism. Original dust cover is in fabulous shape after a 3-Stage plastic buff / hand polish, with only very minor blems. Table looks good and works great! Again, comes with a new, fresh Audio-Technica, Elliptically cut, diamond stylus, AT-95 cartridge. Ready to play!!! Note: These tables, like many 'higher end' tables are VERY critical of 'Level Placement', and it will come with a bubble / spirit level to assist in that task (yes, the feet are adjustable with more than adequate height range). Measures 19.25" wide x 17.75" deep x 6" tall and weighs a HEAVY 27 lbs unpacked. Will include an �e� copy / pdf download of the Pioneer PL-L1000 Owners / users manual and the service manual if purchaser desires. Also has original box and packing. Comes with our standard 90 day limited warranty. � Our technician has completely and EXTENSIVELY gone through and 'Certified' this unit which involves disassembly, cleaning inside and out and the balance of efforts listed below. � As it's 'Quartz Locked', the Platter speed checked and verified for 100% accuracy with our factory test strobe disc. 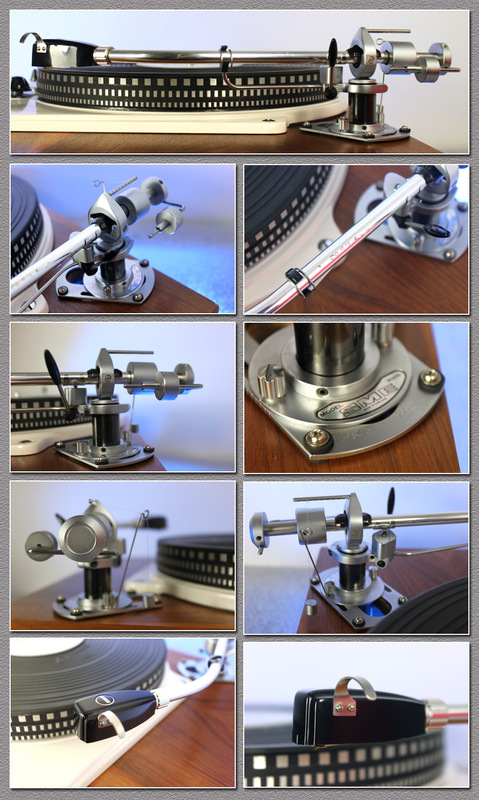 � Tone Arm weighting and �tracking� adjusted for proper tracking with test tone record and O-Scope. � Original dustcover was VERY 'clouded' when it came in from pretty much 100% coverage of scuffs / scratches. 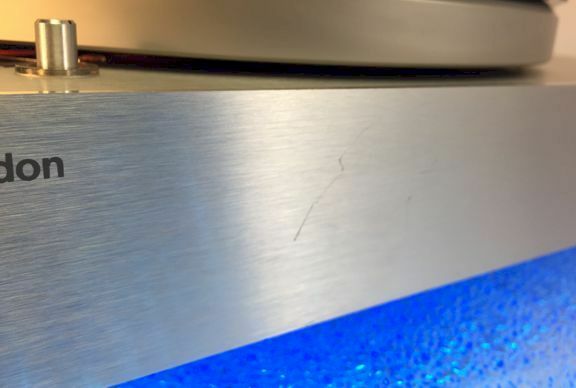 While it's not practical to get to the deepest part of some of the scratches, my tech is a 'magician' with a multi-step 'sanding / polishing compound' process, and buffed it out to about 90+%. It looks GREAT now (above 'After' photos do not do it justice. It's hard to capture just how great it looks now with the camera / lighting). Structurally, it's perfect. No chips, cracks, splits. Hinge attachments perfectly solid. Original, all-metal hinges work perfectly and hold cover up-right. 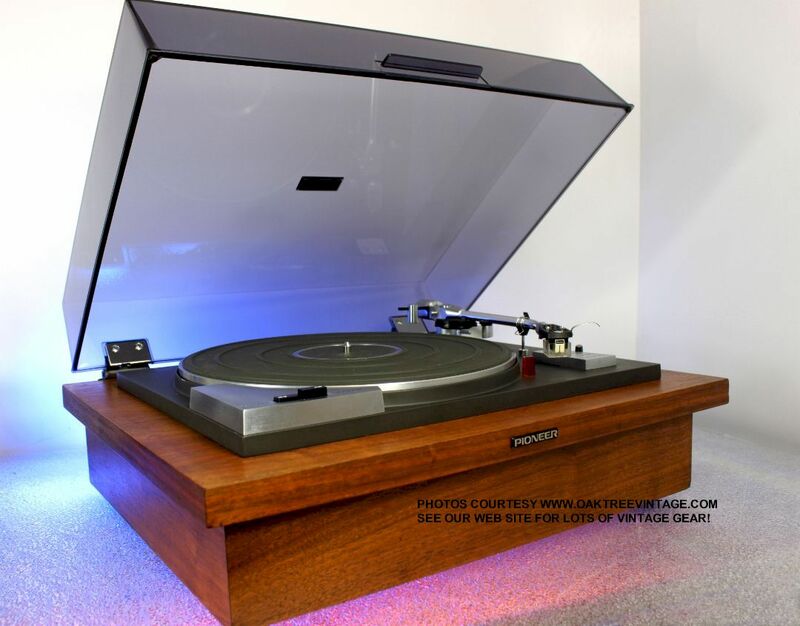 � Cartridge / head shell �overhang� adjusted using shop calibration scale (which also matched the one built-in to the turntable). Total technician time to restore 11+ hrs. 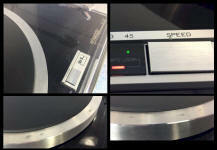 Professional series, Technics SP-25, Direct-Drive, Quartz-Locked, Manual turntable. Very rare table, and first one we've had since I sold them new in the 80's (actually never stocked one, as they were too 'spendy' for our market at the time). From the original Technics SP-25 brochure, "Steady Speed; Speed fluctuation due to load torque (caused by tone-arm or record cleaner drag) is virtually eliminated thanks to the elaborate electronic circuits...If you could place 100 tone-arms, tracking 2 g each onto this turntable, it would still rotate at precisely the chose speed...Large Turntable platter with Threefold Damping...Die-cast Aluminum Base exhibits excellent resistance to acoustic feedback (allows for higher volume levels from amps and speakers with much higher feedback thresholds than typical)"
Overall length: 357mm / 14 3/16"
Effective length: 257mm / 10 1/8"
From the original Audio-Technica ATP-12T manual / brochure, "The ATP Professional Series tone arms have been designed specifically to meet the stringent needs of radio and TV studios, discos, libraries, theaters, schools, and similar demanding applications...Sealed horizontal and vertical ball bearing pivots insure smooth maintenance-free, movement...Precise, equilateral leveling base,...Decoupled counterweight shaft for arm resonance control...Low resistance, anti-corrosion, gold-plated connectors throughout." Only a minor cosmetic issue; 'finish wear', mostly to the very corners of the base (see photos above). Only other issue with the table is above mentioned 'non-functioning' pitch control (only really necessary for a working DJ to 'match beats' when cuing between two tables, or for a radio station to speed up or slow down to fit a narrow time slot). 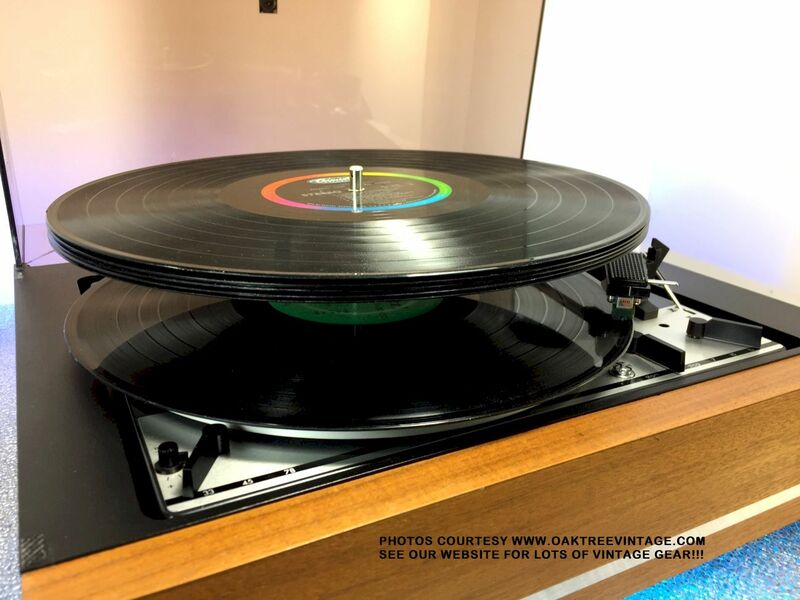 Again, our turntable tech has completely and EXTENSIVELY gone through this table (total tech time ~11+ hours), and following restoration was tested for speed accuracy, rumble, wow & flutter, noise isolation, and tone-arm function. Also, as stated earlier, the dust cover looks great following it's 'multi-step' re-polish process. Table looks good, sounds and works great! Again, comes with an Stanton 680EL, Elliptically cut, diamond stylus, cartridge. Ready to play!! 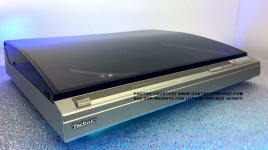 Includes an 'e-copy / pdf download' of the Technics SP-25 Owners / Users manual and brochure. Measures 20.75" wide x 16" deep x 6.75" tall and weighs a HEAVY 36 lbs unpacked. Comes with our standard 90 day limited warranty. � Gimbal bearing, counter weight and anti-skating all adjusted and verified for accuracy. � Platter Drive Motor completely disassembled, bushings 'triple' cleaned (this is a 'must do' on this series) and re-lubed. 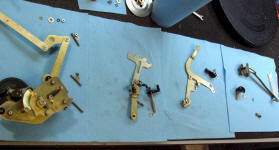 � 'Speed Selector' mechanism completely disassembled, cleaned and re-lubed. � 'Arm Lift / Cuing' mechanism cleaned of old damping gel (most always leaks out on early Pioneer PL's) and fresh 500,000 silicone gel inserted (this is a MUST DO on this series of Pioneer tables). � 'Crumbly', original thrust pad / bearing was replaced with a new 'Delrin' bearing with correct 4mm height and 'collar screws' adjusted level (keeps platter from rubbing on plinth (this is a must do on this series). � Platter spindle bearing cleaned of old lube and re-lubed. 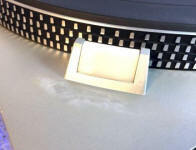 � Fresh, New and Correct belt installed (tested for speed accuracy). 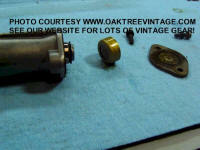 � Original spring loaded, isolation feet in fine condition. � Original dustcover had a buff, and looks fine with typical wear. � Hinges adjusted to hold it upright as well. � Original Real Walnut Wood veneer base cleaned and rubbed with Howards 'Restore-a-Finish' followed by Howards 'Feed-n-Wax'. � Following restoration, the Platter speed checked and verified for 98% accuracy (runs about +2%) with our factory test strobe disc following installation of correct belt. Great performing, sounding and INCREDIBLE looking Pioneer PL-50, Belt Drive, Semi-Automatic turntable. Following the above restoration, it looks fabulous, now functions correctly and performs well. These are very sought after Pioneer turntables due to their size / stature / mass, the platter mass and their belt drive system. 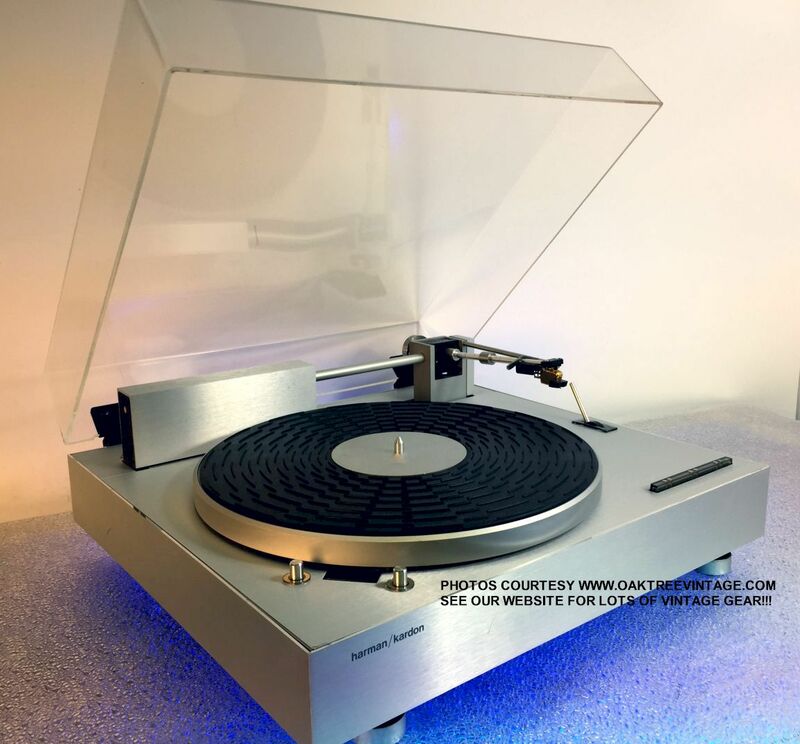 Again, our turntable tech has completely and EXTENSIVELY gone through this table, and following restoration was tested for speed accuracy, rumble, wow & flutter, noise isolation, tone-arm return function and lubed internal mechanism. Original dust cover is in good shape after a buff / hand polish. Table looks good and works great! Comes with original and great performing, �Pioneer�, Elliptically cut, diamond stylus cartridge. Ready to play!!! Measures 19.5" wide x 16.8" deep x 7.75" tall and weighs a HEAVY 22 lbs unpacked. Will include an �e� copy / pdf download of the Pioneer PL-50 Owners / users manual and the service manual if purchaser desires. Comes with our standard 90 day limited warranty. 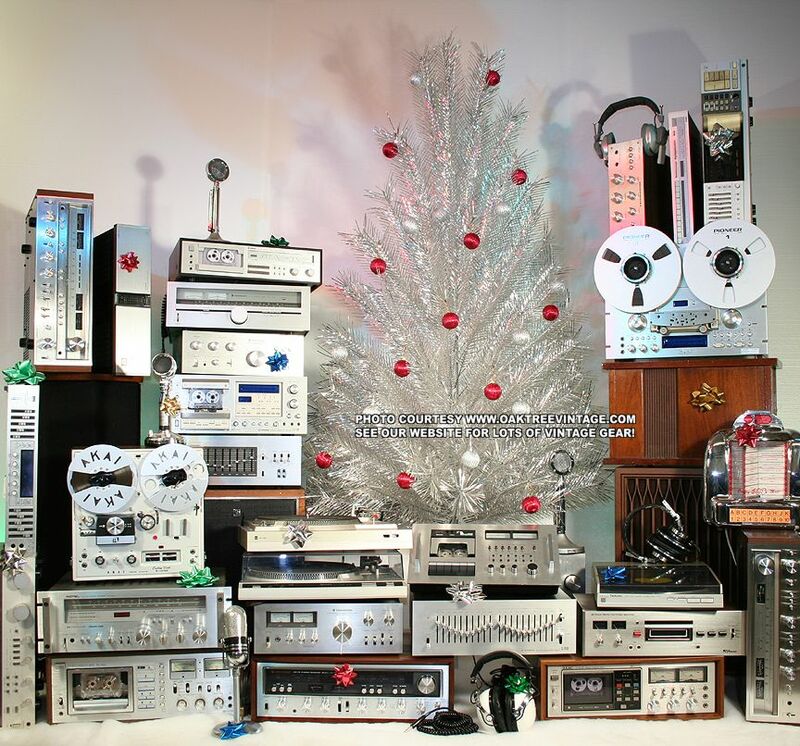 To connect to computer for burning CD's or to a modern A/V receiver that does not have phono inputs, just order one of our inexpensive $42.99 Phono Pre-Amps and cable kits. � Our technician has completely gone through and 'Certified' this unit . 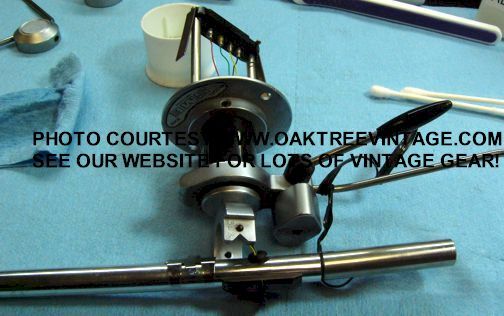 � Tone Arm weighting and �tracking� screw adjusted for proper tracking with test tone record and O-Scope. � Original dustcover had a 3-Stage buff, and looks VERY NICE! Hinges adjusted to hold it upright as well. (note; this is an incredibly well designed and built dust cover, and is of acrylic about 3 times the thickness of most covers) We did photo some very light scuffs, but had to get the light 'just right' to get them to show up in photos. Almost not worth mentioning (see photos above). 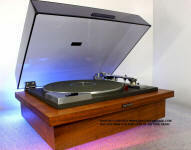 Great performing, sounding and INCREDIBLE looking Kenwood KD-770D, Direct-Drive, Quarter-Automatic turntable. Following the above restoration, it looks fabulous, now functions correctly and performs well. From an original Kenwood KD-770D brochure, "Many turntables cause a loss in musical energy during reproduction through insufficient structural rigidity. With the Kenwood "DL" system, it has been possible to integrated the motor into a solid block of "ARCB" (anti resonant resin-concrete). This in turn is mechanically linked with the tone-arm assembly, so that the entire unit forms one rigid integrated whole. This has important results in terms of accuracy, improved tone-arm tracking and better sound quality." Beautiful table overall. 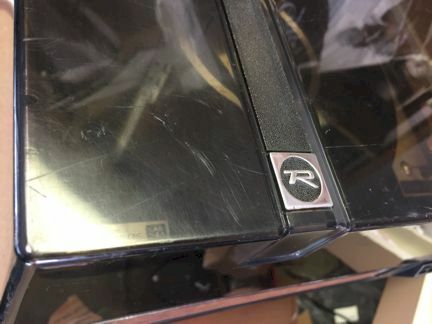 Other than some fine scratches in the dust cover as mentioned earlier, the only other cosmetic items worth mentioning are some black 'smudges' on the platter edges and a small ding near the 'Speed' switch, but again, nothing distracting. This is an elegant and modern looking table. While it appears to be 'Piano Black', it's finish has what appears to be Ebony wood grain thru the clear finish if you look closely. Tone-Arm effective length; 245mm / 9 5/8"
Again, our turntable tech has completely gone through this table, and following restoration was tested for speed accuracy, rumble, wow & flutter, noise isolation, tone-arm function at �end of record�. Original dust cover is in fabulous shape after a 3-Stage plastic buff / hand polish. Beautiful condition. Table looks amazing and works great! Again, comes with a Ortofon OM-10, Elliptically cut, diamond stylus, cartridge. Ready to play!!! This one includes it's ORIGINAL BOX AND PACKING! Measures 19.5" wide x 16.25" deep x 6.5" tall and weighs a HEAVY 26 lbs unpacked. Comes with our standard 90 day limited warranty. � Our technician has completely and EXTENSIVELY gone through and 'Certified' this unit which involves disassembly, cleaning inside and out, COMPLETELY DISASSEMBLING, cleaning and re-lubricating internal mechanisms and the balance of efforts listed below. � Transport / Program selectors (entire control panel) disassembled & cleaned. � Mat replaced with 'Anti-Static' felt. Total technician time to restore 8+ hrs. 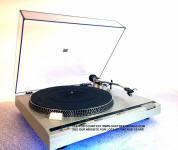 Great performing & sounding Sharp RP-7705, Direct-Drive, Fully-Automatic, and Programmable turntable. Following the above restoration, it looks good, now functions correctly and performs well. Only a few minor cosmetic issues; 'finish wear' to front edge near left controls, 'finish blem' near cartridge alignment pin, glass top has been changed at some time to one with 4705 logo (see photos above). Only other issue with the table is that the tone-arm 'lock' is missing, meaning that if you move or ship the table, you would need to 'tie it down' with a wire tie or similar. Again, our turntable tech has completely and EXTENSIVELY gone through this table (total tech time ~8+ hours), and following restoration was tested for speed accuracy, rumble, wow & flutter, noise isolation, tone-arm function at �end of record�. 'Programming Auto' functions work great! Simply press the cut you wish to hear, and the tone-arm move accurately to it. If you simply wish to hear the entire album side, then just press 'Start'! Table looks good, sounds and works great! Again, comes with an AT4012XE, Elliptically cut, diamond stylus, cartridge. Ready to play!! Measures 18.75" wide x 15.75" deep x 5" tall and weighs a HEAVY 23 lbs unpacked. Comes with our standard 90 day limited warranty. 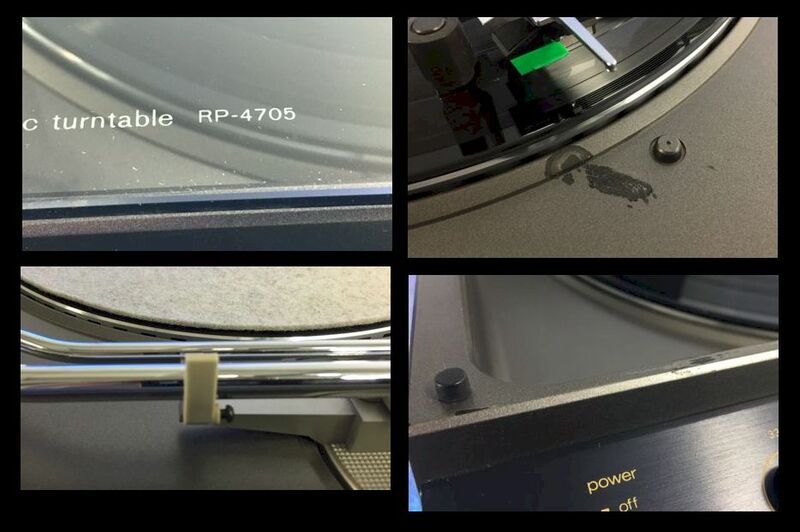 � Our technician has completely gone through and 'Certified' this unit cleaning inside and out, cleaning out �gelled� lubes (a �MUST DO� on all pre-owned / vintage turntables) and re-lubricating mechanism. � Tone-arm �Auto� functions restored, adjusted and tested. � Tone-arm 'lift height' adjusted. 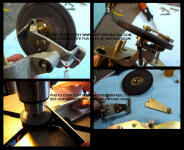 � 'Anti-Skate' mechanism, cleaned and re-lubed w/ silicone lube. � Electronic speed control transistors removed and tested for leakage. � Balance of CB solder joints inspected and 're-flowed' as necessary. � Internal, PCB mounted speed pots cleaned for perfect platter stability. Then adjusted to allow 'user' pots to be 'closely centered'. � External (user adjustable) speed pots cleaned for perfect platter stability. � Entire table was cleaned inside and out. � Speed checked and verified for accuracy with our shop strobe disc. � Original rubber mat, still supple and flexible with no hardening. 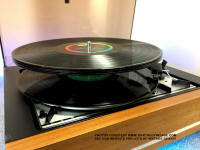 � Our turntable tech also re-installed and adjusted the existing 'Shure' M75ED elliptical stylus, magnetic cartridge and optimized the tone arm for it. (If you prefer an up-grade you may also choose from our selection of new Audio Technica cartridges that we can also set up and ship with it for the additional cartridge cost.) You can readily connect this table to any receiver, Integrated amplifier with a standard magnetic phono input, or a Pre-amp. To connect to computer for burning CD's just order one of our inexpensive Phono Pre-Amps and cable kits. Again, this table looks and works great!! � Unit tested with our myriad of test records, one of which included; Shures' 'Cartridge Obstacle Course' record. Total tech time 9+ hours! � Unit test cycled through 6 LP�s flawlessly. The important advantages which result from the electronic speed control are high stability of turntable speed, negligible wow, flutter and rumble and accurate individual adjustment of each speed. The photo-electronic switch works without any forces acting upon the virtually frictionless and resonance free pick-up arm. Like the electronic On/Off switches it ensures absolutely silent operation. The smoothly running, high-torque motor is placed in a sound proof casing. The pick-up lift with viscosity damping is a valuable control as it helps to prevent records being damaged, it permits immediate interruption of the music and accurate cueing. The latter is further aided by the fact that the main chassis is firmly mounted on the base and the floating suspension of the arm and the heavy, balanced turntable perfectly isolate these against shocks and vibration." Looks fabulous, works and sounds great! Very Solid performer. Just as a 'side note'. This is one of the nicest tables I've had the pleasure to audition and do final testing on. It just runs great, is super quiet and 'accurate feeling'. The tone arm 'feels great' (tracks great too). There's no automatic stuff to break. Even the dust cover has a 'hood prop' to hold it up, so there's no worry that the hinges will get weak over time and let the dust-cover drop. Just say'in. This is also a great looking table as well. Very 'Ikea' like (for those of you who shop there). 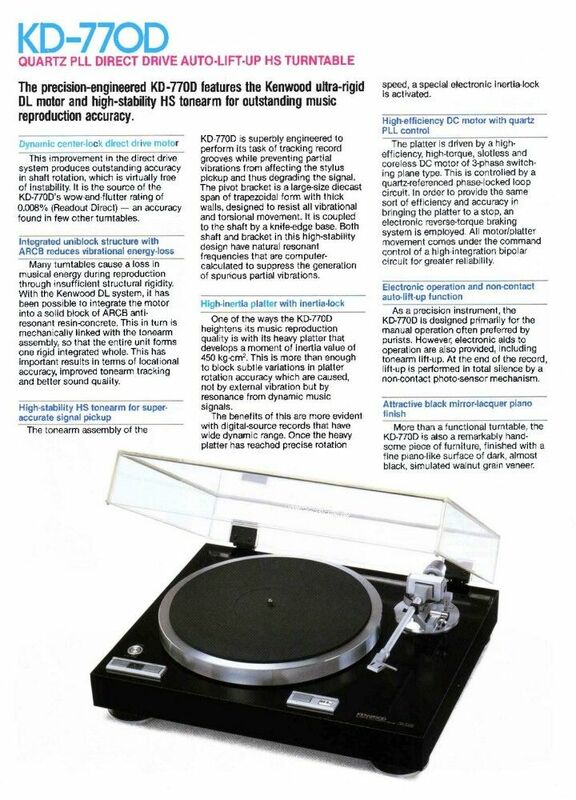 From the original Philips GA-202 brochure, "202 turntable styling is aesthetically simple and attractive. The teakwood (REAL teak wood veneer) trimmed base with smoky hue dust cover, subdued satin finish of metal surfaces and color accented controls quietly compliment any decor". I would have to agree. 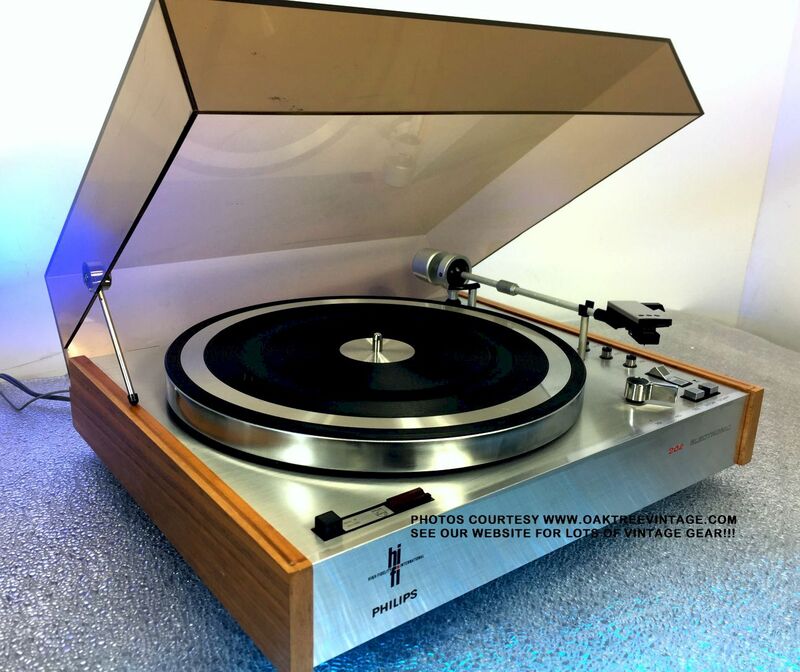 Again, our turntable tech has completely and EXTENSIVELY gone through this Philips GA202 turntable as stated above and 'certified' it's ready to go! Other than some minor cosmetic issues (see above photos), the table looks and works great! Great "Mid-Fi / Hi-Fi" table. Great "all around" table for utility use, and ready to spin your vinyl through those vintage speakers you own. Measures 15.5" wide x 13.5" deep x 5.5" tall and weighs 11 lbs unpacked. Includes pdf / e-copy download of Philips GA-202 turntable owners / users manual and brochure via email. Comes with our standard 90 day limited warranty. W/ BRAND NEW AT-95 CARTRIDGE INSTALLED!!! 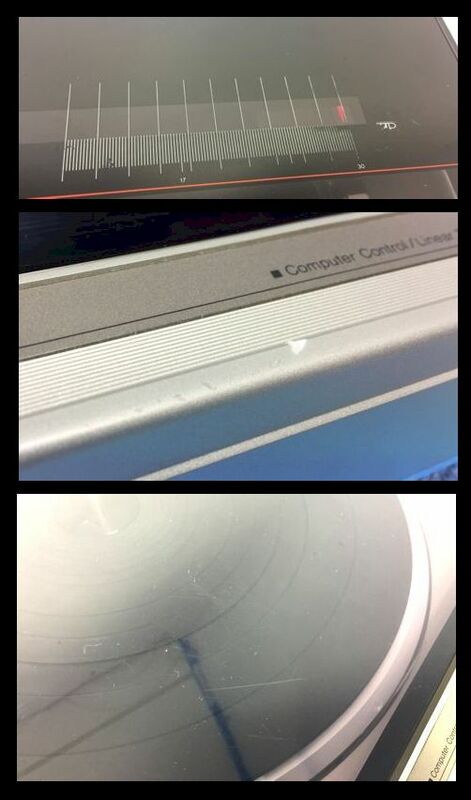 � Our technician has completely gone through and 'Certified' this unit cleaning inside and out, cleaning out �gelled� lubes (a �MUST DO� on all pre-owned / vintage turntables) and re-lubricating mechanism investing ~8 hours of technician time! 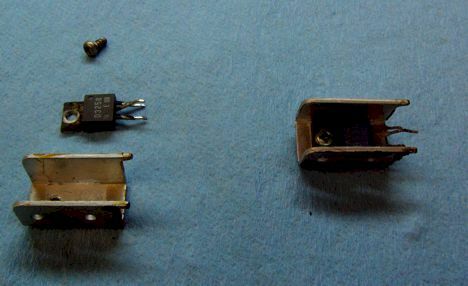 � Tone-arm lead �In / Out� adjusted. � Speed checked and verified for accuracy with technician's factory test strobe disc against built-in strobe. 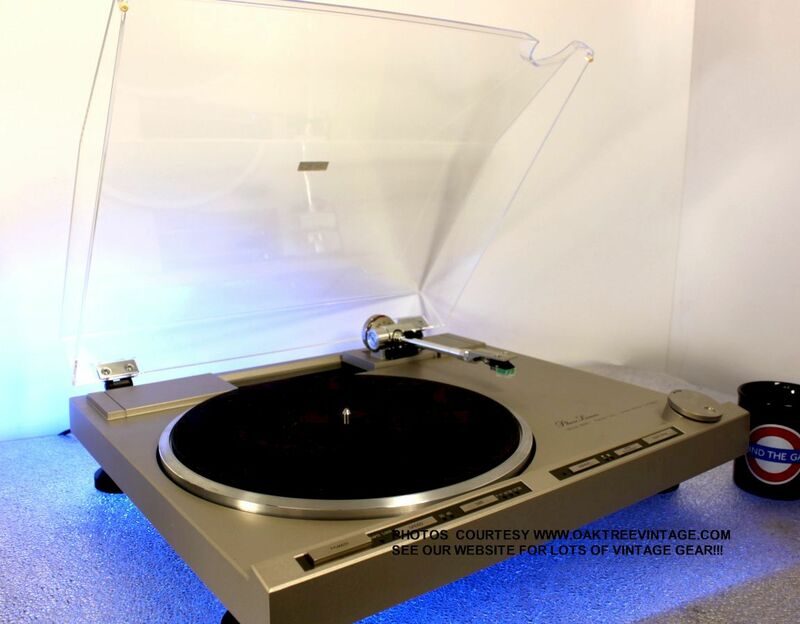 � We also installed and adjusted a BRAND NEW Audio-Technica, AT-95ELCOT, Elliptical cut Diamond, magnetic cartridge and optimized the tone arm for it. (If you prefer an up-grade you may also choose from our selection of new Audio Technica cartridges that we can also set up and ship with it for the additional cartridge cost (but the AT-95 is a great cartridge for 'all around' use, and what I use 90+ % of the time).) You can readily connect this table to any receiver, Integrated amplifier with a standard magnetic phono input, or a Pre-amp. To connect to computer for burning CD's just order one of our inexpensive Phono Pre-Amps and cable kits. Again, this table looks and works great!! � Unit test cycled through 20+ LP�s flawlessly. � Original dustcover hinges are 'blown out' (as they're plastic), and while still intact, will not hold the dust cover up. Due to the condition of the hinges, we did not spend any tech resources on buffing the original cover, so while it's structurally fine, it does have a few scuffs / battle scars. 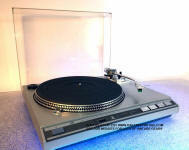 Great quality JVC L-F66, Fully-Automatic, Direct-Drive turntable. Classic, 'curved / 'S-shaped'' tone-arm with universal, 1/2" standard mount head-shell for ease of cartridges changes / substitutions. Plays 33 or 45 RPM vinyl. High quality Gimbal bearing allows for critical adjustment of cartridge tracking / anti-skating. Tone-arm lock intact and functioning properly. Well-built table delivers high quality performance. Effective length: 220mm / 8 11/16"
Very quiet, well performing table. Nice low profile and decent looking. All the "auto" functions work great following the EXTENSIVE refurb work outlined above. Great working and sounding table, and with the NEW Audio-Technica AT-95, elliptically cut, diamond stylus cartridge installed, it's...Ready to Go! Original feet, intact. Measures 17.25" wide x 15.1" deep x 5.25" high and weighs a respectable 12 lbs unpacked. Includes our standard 90 day warranty. � Our technician has completely gone through and 'Certified' this unit cleaning inside and out, cleaning out �gelled� lubes (a �MUST DO� on all pre-owned / vintage turntables) and re-lubricating mechanism, including entire 'carriage worm gear mechanism'. Arm travel mechanism, disassembled, cleaned and re-lubed w/ 500,000 grade silicone gel. Arm mechanism belt replaced with new #045. Speed tested to 100% accuracy. Dust cover had 2-Stage buffing, however still has some surface scurring. Also, some of the white silk-screening is worn from the top (see photos above). Hinge system intact and holds lid in upright position. Total tech time 4+ hours. These are great tables to use. Technics Fully Automatic - Linear tracking, SL-L1, stereo turntable. Essentially "Close and Play". Technics' Linear tables by nature are great if you have cats or children as they must be closed to operate and when the cover is lifted the fragile parts (ie the tone arm and cartridge goes up with the lid. 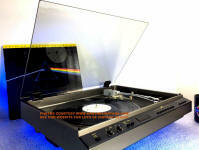 Very dust free, due to lid / cover design and almost impossible to damage your records with! 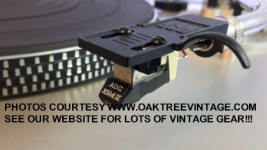 - Built-in 45 RPM adaptor! Again, our turntable tech has completely and EXTENSIVELY gone through this Technics SL-L1 turntable as stated above and 'certified' it's ready to go! Table looks good with fresh "buff" to dust cover, but still shows typical wear. Nothing distracting. This is very similar to one of the tables I use personally (mine's just smaller). Utilizes "P" mount cartridge. Comes with a Stanton E71EE cartridge / stylus. If you prefer an up-grade you may also select from our selection of new Audio Technica cartridges that we can also set up and ship with it for the additional cartridge cost. Everything works great! 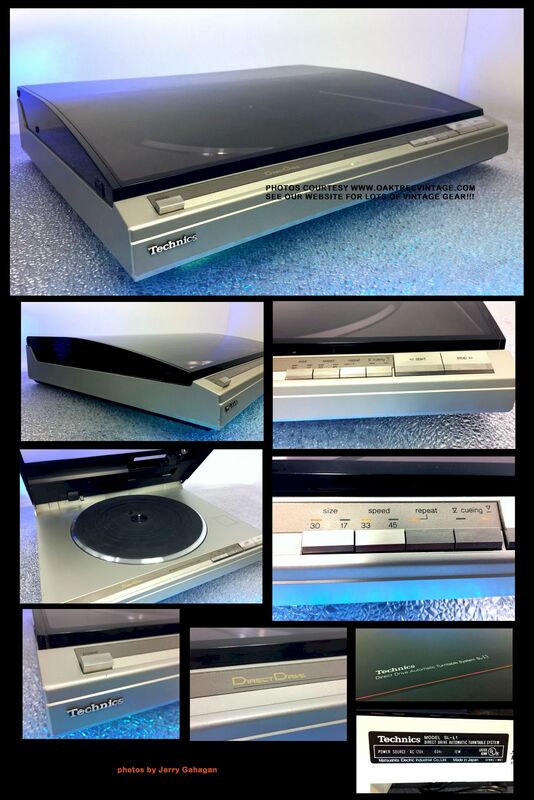 Includes an 'e' copy / pdf download of the Technics SL-L1 owners / users / instruction manual. Measures 17" wide x 14" deep x 3.5" tall (closed) and weighs 16 lbs unpacked. Includes our standard 90 day limited warranty. � Our technician has completely and EXTENSIVELY gone through and 'Certified' this unit which involves disassembly (not an easy task on this table), cleaning inside and out, COMPLETELY DISASSEMBLING, cleaning and re-lubricating internal mechanisms and the balance of efforts listed below. Total technician time to restore 6+ hrs. � Rubber mat still supple and flexible with no hardening. Lays flat w/ no 'bubbles'. 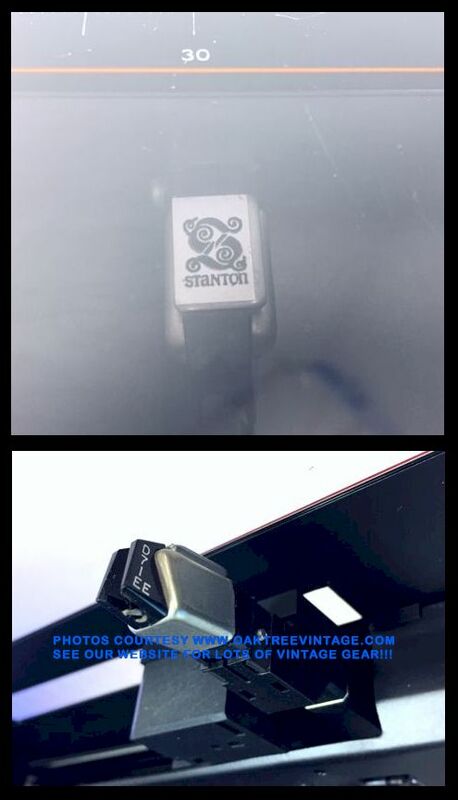 � Table got one of our last 'official' Dual pitch control belts!! � Speed checked and verified for accuracy with both internal strobe and the shop calibrated strobe disc. 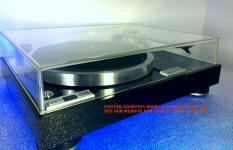 � Platter tested for 'true flat' and no 'run-out' (we had one with 'run-out', that required a new platter). You can readily connect this table to any receiver, Integrated amplifier with a standard magnetic phono input, or a Pre-amp. To connect to computer for burning CD's just order one of our inexpensive Phono Pre-Amps and cable kits. Again, this table looks and works great!! If you're looking for a simple, manual table, but one that doesn't keep 'grinding' at the end of the record (in case you go to sleep while listening) here's your table. 'Quarter Manual' operation meaning that it picks up the tone arm and turns off at the end of the record. Great quality and easy to use. What more (or less) could you ask for?! The Dual 505-2. Floating plinth to dampen resonance and vibrations and Ultra-Low-Mass tone arm coupled with 'mass independent' tracking force Gimbal bearing. Platter Drive System: SM-100-1, 16-Pole, Synchronous motor. Belt Drive. Cartridge type: 'Concord' style U.L.M. Again, we have had the table completely gone through, rolling the clock back about 30 years. Table functions perfectly. Again, has a few battle scars, but mechanically is sound. This one is all about performance. Measures 16.75" wide x 14.75" deep x 6" tall. 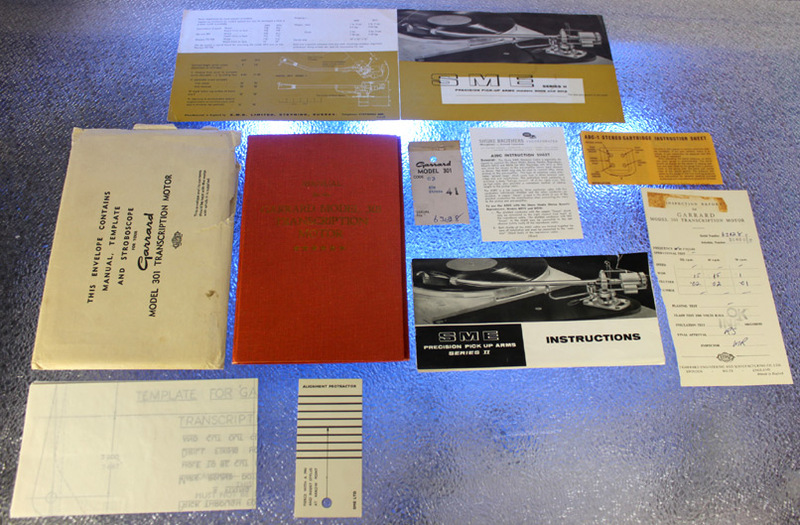 Includes an 'e' copy / pdf download of the Dual 505-2 owners / users / instruction manual, a copy of the sales brochure, and a copy of the Dual 505-2 Service manual if the purchaser so desires. Includes our standard 90 day limited warranty. MORE CHANGER / STACKER TABLES LISTED BELOW. 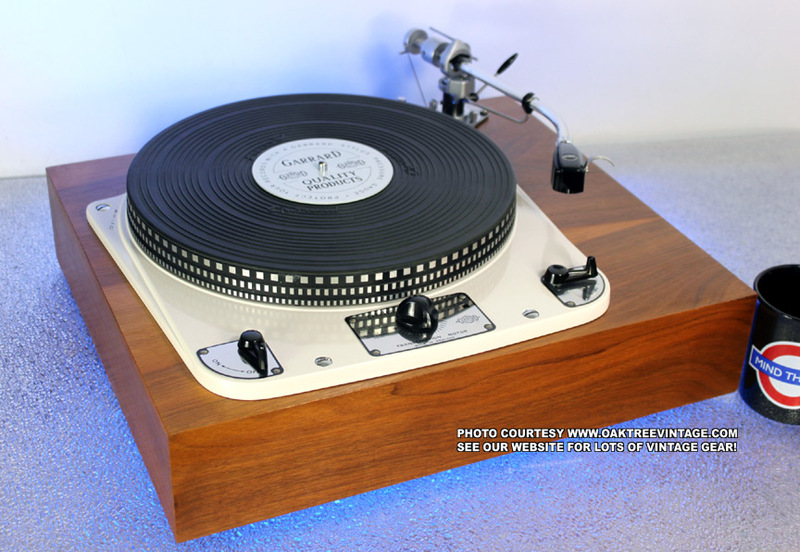 Tables with ceramic cartridges can be connected to any AUX, Tape input, CD input, Computer Sound Card input or any input on any receiver / integrated amplifier regardless of whether it has a phono pre-amp or not. Tables with ceramic cartridges and non-adjustable tone arms, are generally not recommended for critical listening situations, recordings and / or if your record collection is in above average condition and you want to keep it that way. 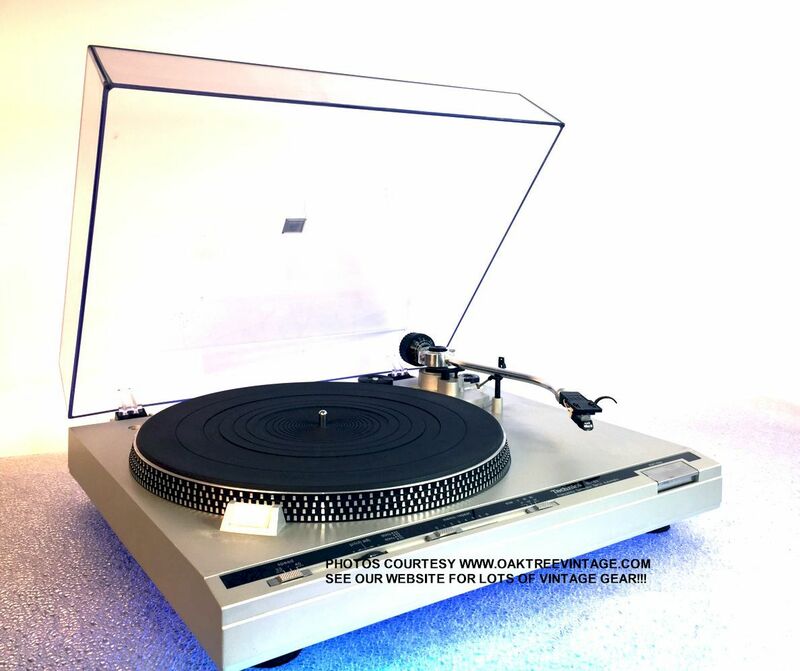 If any of the previous criteria apply, you should consider one of the higher quality turntables listed above utilizing magnetic cartridges and fully adjustable, more critically designed tone arms. Please email or phone with any questions. 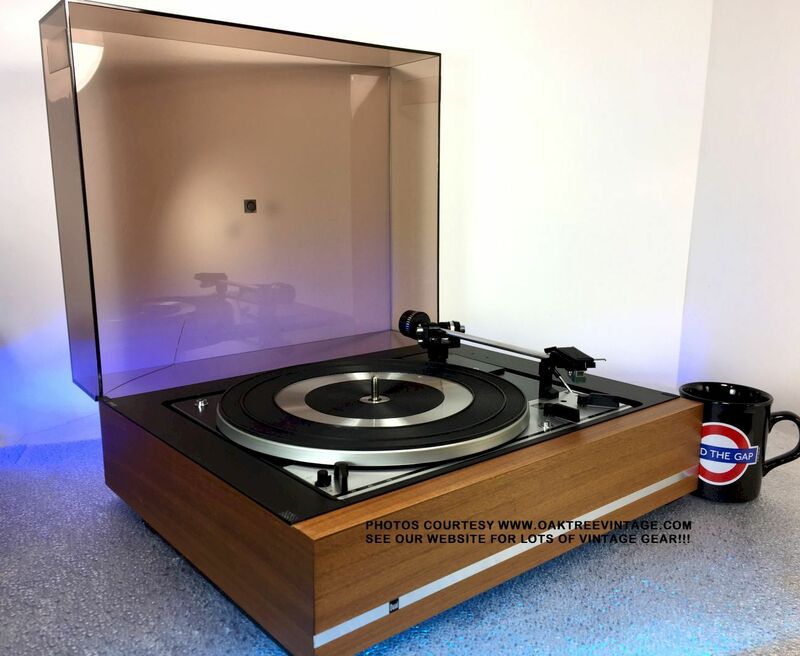 � Our technician has completely gone through and 'Certified' this unit, cleaning inside and out, lubricating mechanism, adjusting tone arm lead out and testing performance. � Entire automatic mechanism COMPLETELY disassembled, de-greased, cleaned and re-lubed, (never an easy task on 'auto' turntables) including; the 'Actuating Slide and Pawl', and both plates. � All internal rubber parts reconditioned including, of course, the idler wheel. 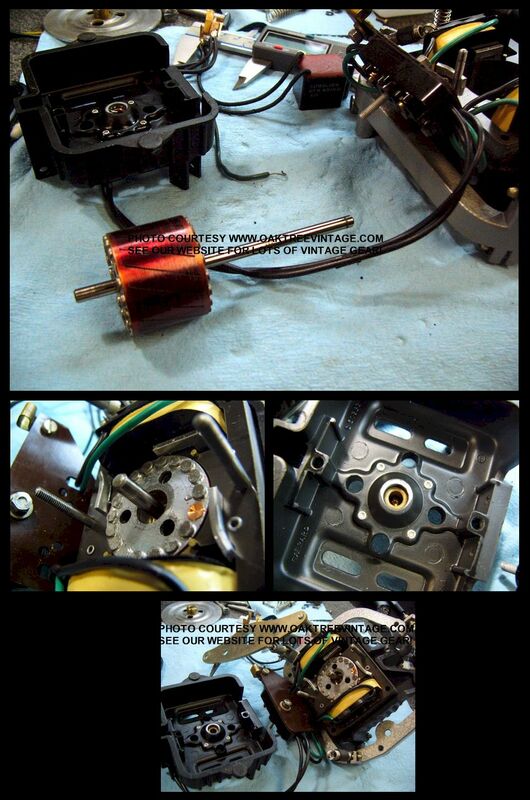 � Drive motor completely disassembled, cleaned and re-lubed. � Platter bearing disassembled, cleaned of old lube and re-lubed. � Tone arm Lead-In and Lead-Out. 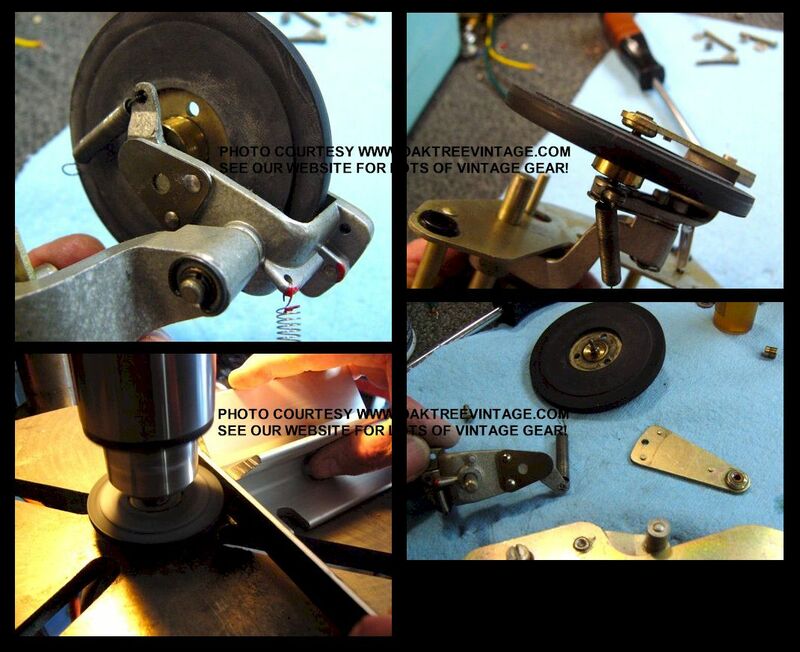 � Tone arm bearing perfectly smooth in operation. � Idler position centered for more positive speed positioning w/ selector. � Original platter mat warp & bubble free. � Excel, ES-70S 'magnetic' cartridge. Tracking and Bias force also re-set to 2g. � Speed checked and verified for accuracy with technician's factory test strobe disc. � He also did an 'orbital buff' to the dustcover and it looks GREAT! Has crack at rear corner that HAS been 'plastic welded' solidly back (looks bad, but solid now). 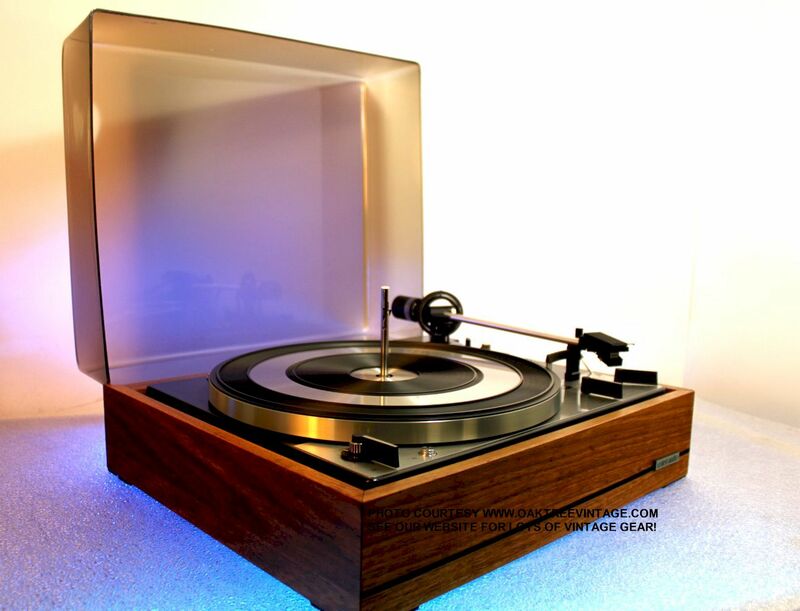 � Real, Teak Wood veneer base structurally solid. Veneer just had a fresh coat of Lemon Oil. Restoration entailed approx 6+ hrs w/ followed with about MANY hours of testing w/ many albums (mostly because we enjoyed having a 'quality' changer on one of the test stations to listen to). 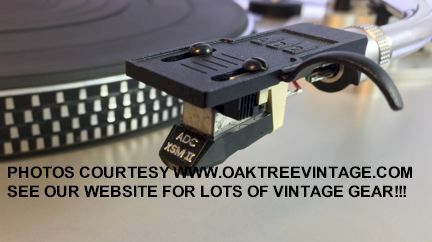 As this turntable has a 'magnetic cartridge' (unlike most 'stacker / changers' which have 'crystal / ceramic / piezo' pickups) you can readily connect this table to any receiver or Integrated amplifier input. For a basic system, or wanting to get introduced or re-introduced to stacking vinyl records, this is a great table. You can readily connect this table to any receiver (including 'modern / A/V / Home Theater receivers) or Integrated amplifier with a standard magnetic phono input, or an external Phono Pre-amp. To connect to computer for burning CD's just order one of our inexpensive Phono Pre-Amps and cable kits. Plays 16, 33, 45 & 78 RPM records. Selects 7", 10" or 12" record size. As stated above, this table has had EXTENSIVE refurb / restore work. Cosmetically, the table looks great. Again, our turntable tech has completely and EXTENSIVELY gone through this table (total tech time 6 hours). Following, and ONLY DUE TO the above restoration / refurbishment, the table starts as it should, and end's as it should with no 'end groove hang up'! (While Dual purports stacks of 5 LPs as 'typical', normally you should typically only get about 3-4 on a stack with no issues, and you won't always get '6' to work, but... this table, #8160 was test played thru 30+ cycles and tested thru multiple stacks, with 6X LP's stacked with no issues!!! Occasionally you'll have a record 'hang up' or 'double drop', but that's almost always due to errantly drilled, elliptical or center holes that are 'too tight' in one of the records. Overall the table works beautifully and all functions now work GREAT! We also re-installed the 'Excell', ES-70S cartridge and optimized the table for it. (If you prefer an up-grade you may also choose from our selection of new Audio Technica cartridges that we can also set up and ship with it for the additional cartridge cost.) You can readily connect this table to any receiver, Integrated amplifier with a standard magnetic phono input, or a Pre-amp. To connect to computer for burning CD's just order one of our inexpensive Phono Pre-Amps and cable kits. Again, this table looks near new and works great!! First DUAL 1214, fully automatic changer phonograph. This is the first "Dual 1214" that we've had in over 20 years that we've restored (due to finally having a technician that's up to the task). 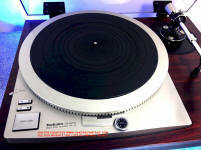 Very nice Dual 1214 Stacker / Changer / Single play, Fully-Automatic turntable. Very difficult to 'break' one of these. These are very well built turntables featuring an adjustable speed belt drive platter, but here's the VERY IMPORTANT POINT about the 1214. It is one of the few Dual models, offering 'adjustable platter speed' that does NOT utilize a 'toothed belt'. It uses a 'tapered' motor drive pulley. The original 'Toothed' belts, utilized by Dual on MANY of their turntables are now 'UNOBTAINIUM' now, and any of the original / NOS ones still floating around are likely 'dry rotted' and useless. We've tried 'O-rings' (both single and double) with limited success. NOT to worry on this model as it doesn't use that system at all (and that is VERY important). Tonearm: Extra-long, torsionally rigid metal arm, mounted on 'vertical needle bearings and horizontal, 2-layer precision ball bearings. Again, as previously stated, the table has just been completely gone through by our senior turntable technician and is "Ready to Go"! Following refurbishment / and final inspection / sign off, the table has gone thru a minimum of 30 play cycles, including a minimum of 6 plays of 6x record stacks. 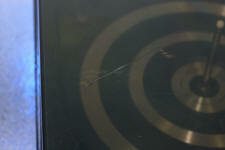 Again, the only cosmetic issue is the repaired crack in the dust cover (see photos above). You will not be disappointed in this table for all around use. Includes 'e-copy' / pdf download of the Dual 1214 Owners / Users manual, and the Service manual if the purchaser desires. Comes with "Stacker / Changer" tall spindle and 'Short / Single Play' spindle. Measures 18" wide x 16" deep x 9" tall and weighs a heavy 16 lbs unpacked. Includes our standard 90 day limited warranty. 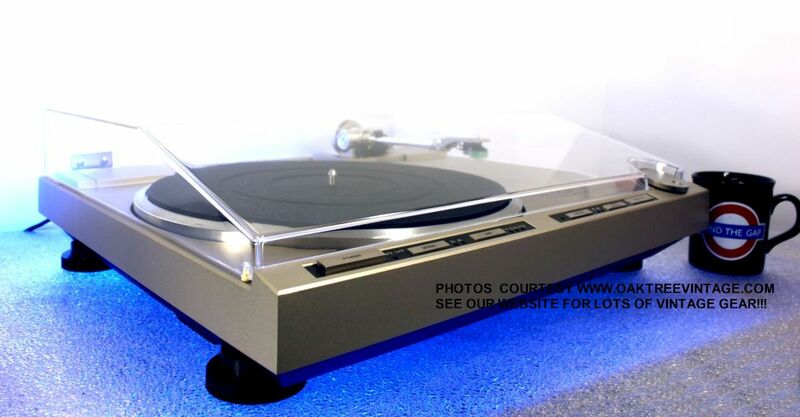 Most of our turntables are 'component turntables', meaning that you connect them to YOUR EXISTING stereo systems' 'Phono Input' or (another input, utilizing an external 'Phono Pre-Amp'). What...you DON'T have an existing component stereo system? Not to fear. All you need is a pair of powered speakers ('think' the small speakers that came with your computer), and an inexpensive Phono Pre-amp. You probably already have a pair of 'computer speakers' you can use (or grab a pair on your next trip to a local thrift store), and we have inexpensive phono pre-amps for less than $40, including all the cables you need, that will work. We've tested this set-up and it works great! Give us a call for further info, or to order a turntable and the balance of what you would need. but generally function best with 3 or less stacked at a time. Occasionally a 'stacker / changer' will either 'not drop' a record, or may drop more than one at a time. The physics of the mechanism / record hold size and internal shape will be different on various records, and it's not, nor never was a 'fine science'. Having said that, stacked records will 'drop and play' in order, just fine, the majority of the time on a fully serviced / properly refurbished record changer / stacker. Also, for optimum performance, special a special stylus is required for 78 RPM records. 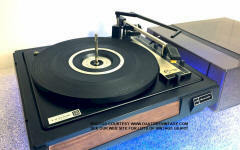 While you will get sound from a stylus designed for normal / 33 / 45 RPM records, it is best not to use the same stylus for both 78's and that is used for 33 1/3's / 45's. Concerned about how your turntable will be packed for safe transit. 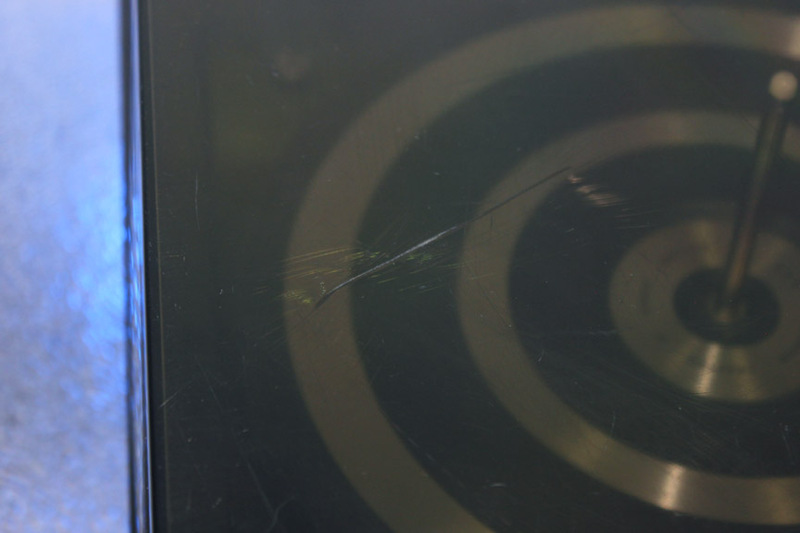 The vast majority of turntables shipped from individual sellers, especially the one's from on-line auctions, are damaged in transit due to inadequate / inappropriate packing. It is VERY difficult to do successfully and most folks do not have the experience or materials to do it anything close to adequately. Click here to see how we do it and what has worked for the past 12 years. 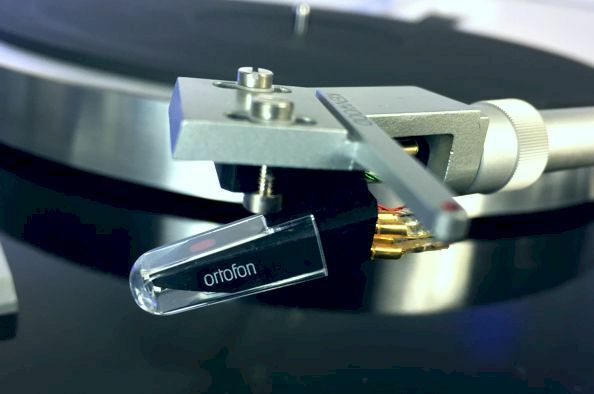 We are proud to announce the arrival of Audio-Technica turntable Cartridges to our line of high quality audio accessories. 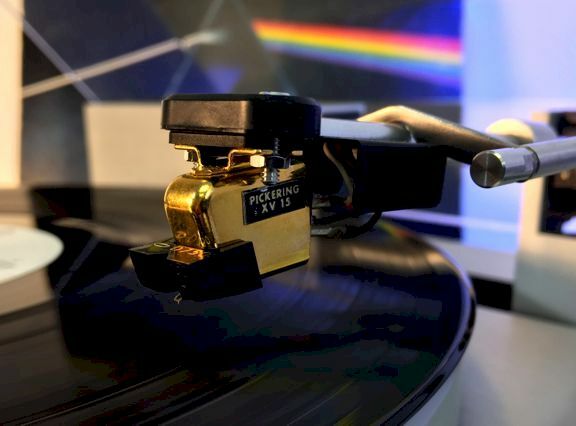 Their turntable Cartridges have long been recognized as some of the best quality available while still being one of the most affordable in the industry. 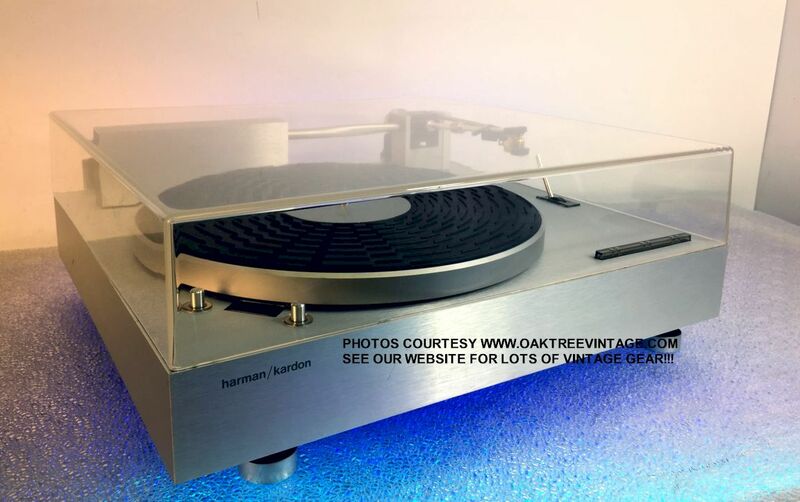 "This is one of the �coolest� tables I�ve experienced"
We have had this table in the warehouse for over 10 years, waiting for the 'right technician' to �challenge� it. Not only was, our current senior technician up to the task, and restored this one beautifully and CORRECTLY, he owns two himself that are his main tables, over his Thorens TD 145 mk2 and Garrard 301! � Our technician has completely and EXTENSIVELY gone through and 'Certified' this unit which involves disassembly (not an easy task on this table), cleaning inside and out, COMPLETELY DISASSEMBLING, cleaning and re-lubricating internal mechanisms and the balance of efforts listed below. Total technician time to restore 20+ hrs. � Original dustcover had a 3-Stage buff, and looks INCREDIBLE. Hinges adjusted to hold it upright as well. Great performing, sounding and INCREDIBLE looking Harman Kardon / Rabco ST-7, Tangential Tracking, Belt-Drive, Quarter-Automatic turntable. Following the above restoration, it looks fabulous, now functions correctly and performs well. 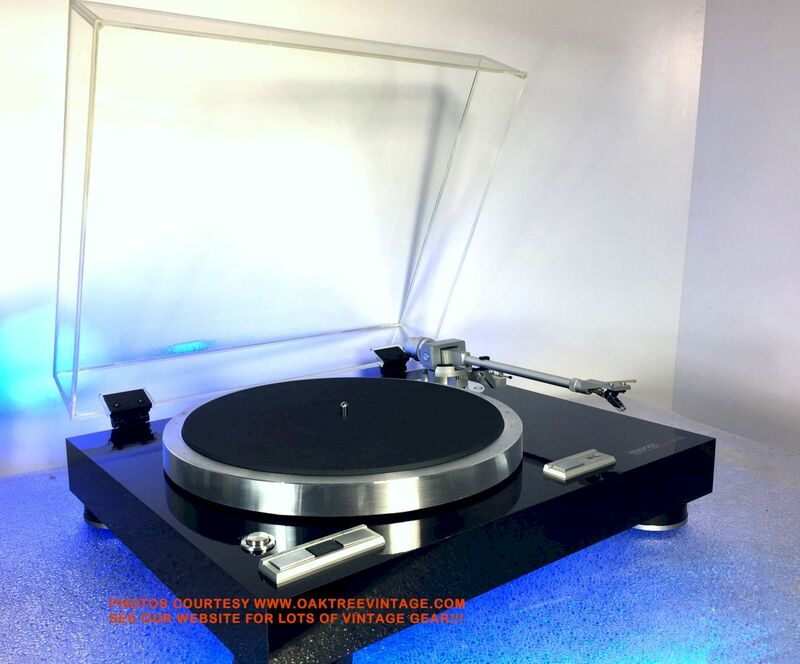 Again, our turntable tech has completely and EXTENSIVELY gone through this table (total tech time ~20 hours), and following restoration was tested for speed accuracy, rumble, wow & flutter, noise isolation, tone-arm function at �end of record�. Original dust cover is in fabulous shape after a 3-Stage plastic buff / hand polish. Beautiful condition. Table looks amazing and works great! Again, comes with a Pickering XV 15, Elliptically cut, diamond stylus, cartridge. Ready to play!!! Note: These tables, like many 'higher end' tables are VERY critical of 'Level Placement'. Will include an �e� copy / pdf download of the Harman Kardon / Rabco ST-7 Owners / user�s manual and the service manual if purchaser desires. ). Measures 16.5" wide x 16.25" deep x 6.75" tall and weighs a HEAVY 23 lbs unpacked. Comes with our standard 90 day limited warranty. � Entire internal 'Auto' mechanisms COMPLETELY disassembled, cleaned and re-lubed (never an easy task on 'auto' turntables). � Platter spindle disassembled, cleaned of old lube and re-lubed. � Main shaft gear repaired. Following the above technical restore work, this table looks fine, functions perfectly and sounds great! 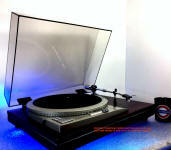 Great condition, Quiet Belt Drive, Fully Auto, Technics, SL-B3 Turntable. Utilizes a 'universal' head-shell for standard fit, 1/2" mount cartridges (again, the table comes with the "ADC XSM-MKII" Cartridge pre-installed from us. Good solid performer. Looks good, works fine, reliable and easy to use. What else do you need?! Cartridge type: Accepts all 1/2" "Standard" mount and "Universal Head shell"
Maximum Tracking error: 2.5� / in. 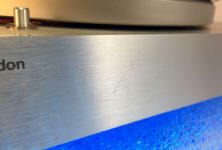 Diamond tip (bonded to sapphire): Elliptical cut 0.0003 x 0.0007"
Again, this table has been completely gone through and original dust cover just had a fresh buff and not only is crack free, but for the most part free of distracting scuffs / scratches. Only very minor cosmetic wear. Hinges and 'hinge areas' of dust cover completely intact, and hinges hold dust cover up perfectly well. There's just a bit of 'finish wear' in front of the 'strobe light' (see photos above). It looks, works great and is ready to go! You will not be disappointed in this table for all around use. Looks and works great! Includes an 'e' copy / pdf download of the Technics SL-B3 owners / users / instruction manual. Measures 17" wide x 14" deep x 5.5" tall and weighs 9 lbs unpacked. Includes our standard 90 day limited warranty. 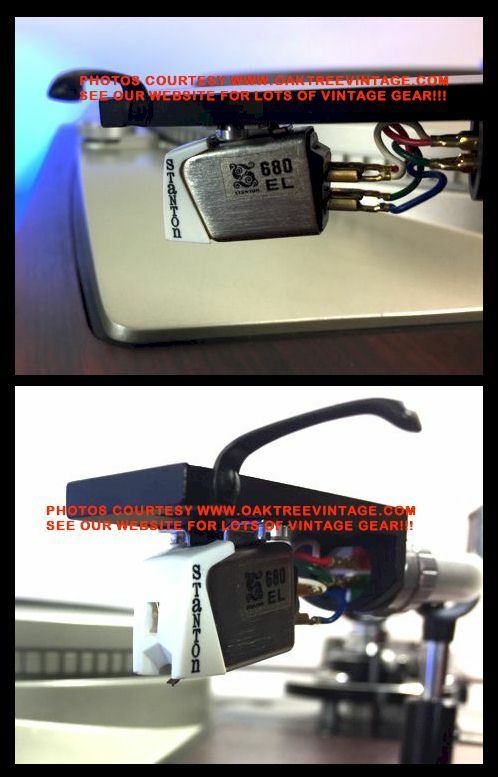 & w/ ADC XSM-MKII, Elliptically cut, Diamond stylus cartridge installed w/ 6+mV output! � All internal rubber parts reconditioned including, of course, the 'intermediate' idler wheel. � Drive motor disassembled, cleaned and re-lubed. � 'Trip pawl' cleaned for 'smooth end of album cycle. � Table cosmetics detailed as much as practical. 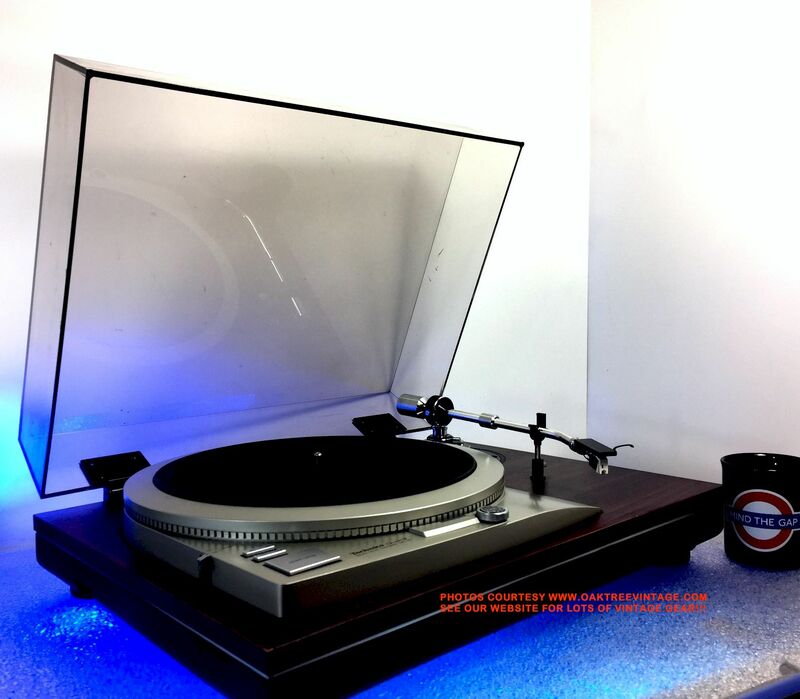 � Original, Smoked, Plexi-glass Dust cover is 'functional', but is not going to win any 'beauty contests' with an old crack / stress fractures in one area of the top, and covered in numerous scratches, scuffs and striations. Structurally / functionally fine, including the 'hinge tabs'. � Original Platter bubble / warp free. � We *added 8oz of weights to the original 12oz platter, to bring it to 20 ounces (over a pound), which really adds to a turntables 'speed stability', reduces 'WoW', and allows for more positive 'auto-function' to the arm mechanism. 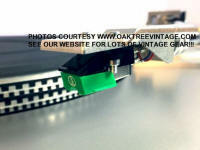 � New Audio-Technica, Diamond Stylus, 'magnetic' cartridge installed. Tracking and Bias force also re-set to 2g. Following, and only due to the above restoration / refurbishment, the table starts as it should, and end's as it should with no 'end groove hang up'! Unit was test played thru 4 cycles and tested with 6X LP's stacked with no issues!!! (normally you should typically only get about 3 on a stack with no issues, and you won't always get '6' to work, but...) (also, as you stack on more records, especially once you get to 5 and certainly 6, depending on the overall 'thickness' of the albums in the stack, 'tone arm 'cuing'' will cease to have enough clearance to function correctly on ANY stacker / changer. Just FYI). Overall the table works beautifully and all functions now work GREAT! Restoration entailed approx 7+ hrs w/ followed with about MANY hours of testing w/ many albums (20+ LPs, mostly because we enjoyed having a 'quality' changer on one of the test stations to listen to). 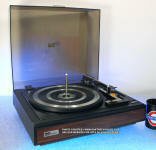 Great mechanical / electrical condition BSR / McDonald 2260AG, fully automatic changer phonograph. Plays 33, 45 & 78 RPM records. Selects 7", 10" or 12" record size. Cosmetically, the table looks great. Again, the dustcover has a 'repaired crack', numerous scuffs / striations remaining, but overall looks acceptable, and not distracting. We photographed the 'worst' of it (see above). Balance of the table looks fine. - Platter weight increased to 20oz over the original 12.6 ounces. - Stacker / Changer capable on 33's & 78's. Sorry, but we do not have a '45' stacker spindle for this one, nor the 'single' spindle. Only the standard 'small hole' stacker spindle. You can still play 'single' records, and with the correct 'hole adaptors', you can stack 45's as well. Both of this conditions are typical of almost every 'stacker / changer' we sell. 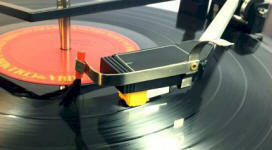 - Record Size selector- allows 'Auto' or 'Stacking' of any size record at any speed! Again, our turntable tech has completely and EXTENSIVELY gone through this BSR / McDonald 2266AG turntable as stated above and 'certified' it's ready to go! Entire table functions beautifully following the above mentioned, complete tear-down and re-build / refurb. ALL functions work great! Comes with a new Audio-Technica 'Yellow', Magnetic cartridge that has been installed and optimized for the tone-arm. Ready to use! Includes our standard 90 day limited warranty. Measures 17.5" wide x 14.5" deep x 7.75" tall and weighs 13 lbs unpacked. & W/ NEW Audio-Technica, Diamond stylus cartridge installed! � Our technician has completely and EXTENSIVELY gone through and 'Certified' this unit which involves disassembly (not an easy task on this table), cleaning inside and out, COMPLETELY DISASSEMBLING, cleaning and re-lubricating internal mechanisms and the balance of efforts listed below. Total technician time to restore 29 HOURS! � Platter spindle bearing disassembled, cleaned, inspected and re-lubed. � Rubber mat still supple and flexible with no hardening (does have a few of the typical, short, radial cracks from the spindle hole). � While the platter speed was 100% 'spot on', it was at the end of the speed control's travel. We corrected this by adding to the original magnetics so that it's now 100% when the control is positioned in the 'CENTER' of it's range. � Platter speed checked and verified for 100% accuracy with our factory test strobe disc following above work. � Platter tested for 'true flat' and no 'run-out'. 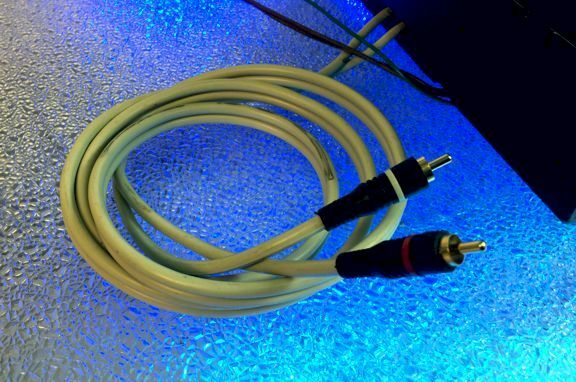 � We installed 24kt Gold Cartridge / head-shell leads instead of the 'as found' 'soldered-on' wires that were connecting the cartridge to facilitate cartridge changes / up-grades in the future. � We also reinstalled and optimized the tone arm for the originally purchased / installed ADC, Model One, magnetic cartridge. 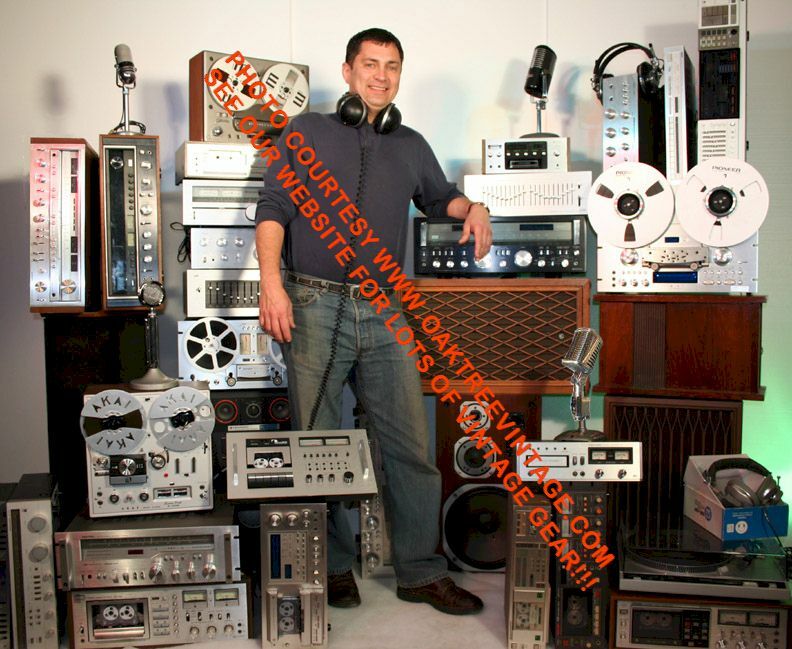 This was a 'one owner / consumer / audiophile' owned unit and was not used commercially. The only issues that we did not correct for was the single owner inscribed his id info on the plinth top (left, rear corner mounting 'ear') and underneath and laterally on the tone-arm (see photos above). Turntable Motor: Shaded Pole Induction in heavy cast casing, suspended on six tensioned springs. Magnetically screened. Platter 'Spool-Up' time: 4-6 sec. S/N - Rumble: "Almost non-existent"
Tone arm Type: Angled Aluminum Pipe, 'Wood Lined' to reduce resonance. Tone-Arm on 'Knife Edge' vertical bearing mechanism. Lateral / Pillar bearings are "high precision" and totally enclosed against dust. Recommended loading impedance: 47K ohms (standard, requires only standard phono pre-amp built-into most gear). If you're looking at this then there's not much we can tell you that you likely don't already know. It is the "Oil Bearing" version, with the originally, optional / upgrade, strobe marked (60Hz), 5 lb aluminum platter. And again, it just had the above itemized restoration and is ready to go. In BEAUTIFUL condition all around. Original White Enamel finish on chassis in great shape. The VERY SOUGHT AFTER SME 3009 Mark II tone arm is in equally great performing shape. The tone arm includes 'one' of the "Rider Weights". For excessively heavy cartridges, you may need to source an additional "Rider Weight" (not sure why anyone would want to run and 'excessively heavy' cartridge). Table comes up to speed in about 3-4 revolutions (very heavy 5 lb cast aluminum platter) and stays on. Motor runs perfectly and is "Dead" silent for noise. This table is likely from 1961-63, based on it's serial, and production quantities over the years this model spanned, and the edition of the manual. Based on the condition of the idler and the bronze bearing, it has seen little use in it's life. Owner took immaculate care of it and the entire system. 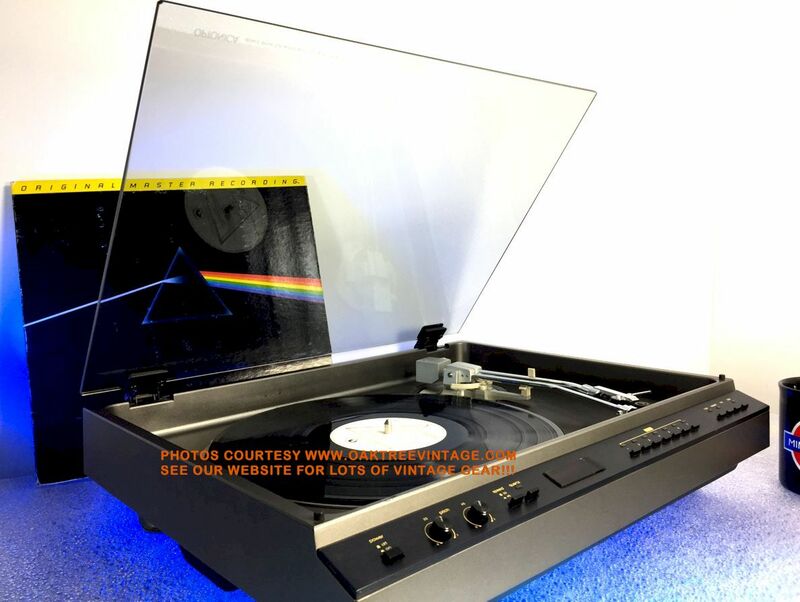 Comes with all of it's original paperwork, including the 'brown, hard cover Garrard 301 Transcription Turntable Owners / Users manual, original Motor inspection report, the SME 3009 mk II owners manual and alignment protractor, and the owners manual for the ADC Model One Cartridge and more! Measures overall 17.5" wide x 15." front to back. Table has our standard 90 day limited warranty. � He also replaced the anemic, factory RCA cables, with some much higher grade, fully shielded interlink cables, w/ 24kt gold RCA connectors. � Dust cover 'multi-stage' buffed for improved appearance with no cracks, splits or serious 'battle scars' (actually looks very nice for 45 years old). � New Shure M97-E, Elliptically cut, Diamond Stylus, installed on the Shure 'magnetic' cartridge. Tracking and Bias force also re-set to 2g. � Tested / analyzed and passed for motor noise and 60Hz hum (once cartridge 'sled' was replaced and had contacts burnished!). � He also did an 'orbital buff' to the dustcover and it looks FANTASTIC!!! No cracks, chips or splits to it. Restoration entailed approx 19+ hrs w/ followed with about MANY hours of testing w/ many albums (mostly because we enjoyed having a 'quality' changer on one of the test stations to listen to). Again, our turntable tech has completely and EXTENSIVELY gone through this table (total tech time ~19+ hours). Following, and ONLY DUE TO the above restoration / refurbishment, the table starts as it should, and end's as it should with no 'end groove hang up'! (While Dual purports stacks of 5 LPs as 'typical', normally you should typically only get about 3-4 on a stack with no issues, and you won't always get '6' to work, but... this table, #5223 was test played thru 25+ cycles and tested thru multiple stacks, with 6X LP's stacked with no issues!!! Occasionally you'll have a record 'hang up' or 'double drop', but that's almost always due to errantly drilled, elliptical or center holes that are 'too tight' in one of the records. Overall the table works beautifully and all functions now work GREAT! 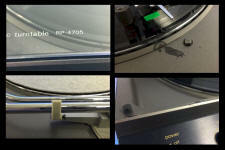 We also re-installed a Shure cartridge with a brand new 'M75-E TYPE 2' stylus and optimized the table for it. (If you prefer an up-grade you may also choose from our selection of new Audio Technica cartridges that we can also set up and ship with it for the additional cartridge cost.) You can readily connect this table to any receiver, Integrated amplifier with a standard magnetic phono input, or a Pre-amp. To connect to computer for burning CD's just order one of our inexpensive Phono Pre-Amps and cable kits. Again, this table looks near new and works great!! Famous, sought after, and one of their more 'durably designed' DUAL 1219, fully automatic changer phonograph. This is one of only two "Dual 1219s" that we've had in over 20 years that we've restored (due to finally having a technician that's up to the task). 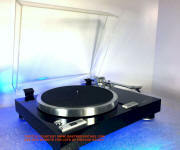 Very nice Dual 1219 Stacker / Changer / Single play, Fully-Automatic turntable. One of the most sought after Dual's due to it's 'simple and durable' design. Very difficult to 'break' one of thes. These are very well built turntables featuring an adjustable speed belt drive platter, but here's the VERY IMPORTANT POINT about the 1219. It is one of the few Dual models, offering 'adjustable platter speed' that does NOT utilize a 'toothed belt'. It uses a 'tapered' motor drive pulley. 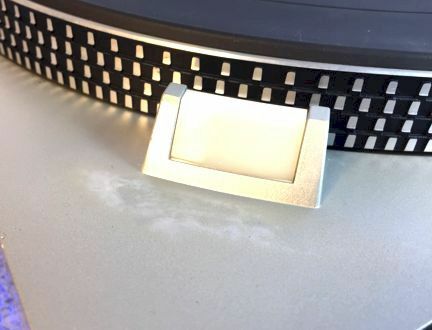 The original 'Toothed' belts, utilized by Dual on MANY of their turntables are now 'UNOBTAINIUM' now, and any of the original / NOS ones still floating around are likely 'dry rotted' and useless. We've tried 'O-rings' (both single and double) with limited success. NOT to worry on this model as it doesn't use that system at all (and that is VERY important). Tonearm: Extra-long, torsionally rigid metal arm, mounted on 4 point Gimbal type bearings. Skeletal head. Again, as previously stated, the table has just been completely gone through by our senior turntable technician and is "Ready to Go"! Following refurbishment / and final inspection / sign off, the table has gone thru a minimum of 25 play cycles, including a minimum of 6 plays of 6x record stacks. You will not be disappointed in this table for all around use. Comes with "Stacker / Changer" tall spindle and 'short / single play' spindle and a pair of 'up-graded' RCA interlinks. Measures 18" wide x 16" deep x 9" tall and weighs a heavy 16 lbs unpacked. Includes our standard 90 day limited warranty. Restoration entailed approx 7+ hrs w/ followed with about MANY hours of testing w/ many albums (mostly because we enjoyed having a 'quality' changer on one of the test stations to listen to). 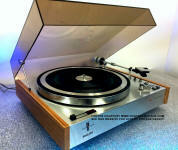 Great mechanical / electrical condition BSR / Realistic 'Professional Series', LAB 24A, fully automatic changer phonograph. Plays 16, 33, 45 & 78 RPM records. Selects 7", 10" or 12" record size. Cosmetically, the table looks great. The dustcover did have a light buff, but to keep the price affordable, we did not spend as much time on it as we might a table that's in the 'grand $' price range. It has numerous scuffs / striations remaining, but overall looks acceptable, and not distracting. We photographed the 'worst' of it (see above). No cracks, chips or splits to it. - Stacker / Changer capable on 16, 33's & 78's. Sorry, but we do not have a '45' stacker spindle for this one. 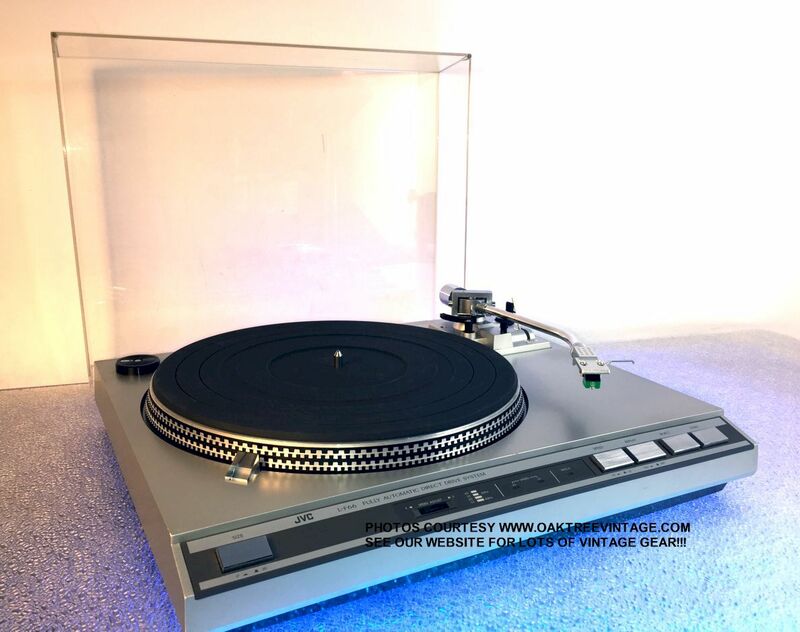 Again, our turntable tech has completely and EXTENSIVELY gone through this BSR / Realistic PRO LAB 24A turntable as stated above and 'certified' it's ready to go! Entire table functions beautifully following the above mentioned, complete tear-down and re-build / refurb. ALL functions work great! Comes with a new Audio-Technica 'Yellow', Magnetic cartridge that has been installed and optimized for the tone-arm. Here's a place to download a printable strobe disc for testing your turntables speed, if you don't have a built in strobe. The 'Audio-Technica' turntables shipped as 'New' from Audio-Technica, are not 'refundable'. If there is a quality / product problem, a replacement unit will be sent upon return of defective unit.